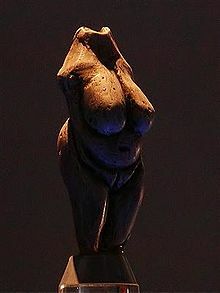 They are known for their Venus figurines, which were typically made as either ivory or limestone carvings. The Gravettian culture was first identified at the site of La Gravette in Southwestern France. The Gravettians were hunter-gatherers who lived in a bitterly cold period of European prehistory, and Gravettian lifestyle was shaped by the climate. Pleniglacial environmental changes forced them to adapt. West and Central Europe were extremely cold during this period. Archaeologists usually describe two regional variants: the western Gravettian, known mainly from cave sites in France, Spain and Britain, and the eastern Gravettian in Central Europe and Russia. The eastern Gravettians, which include the Pavlovian culture, were specialized mammoth hunters, whose remains are usually found not in caves but in open air sites. Gravettian culture thrived on their ability to hunt animals. They utilized a variety of tools and hunting strategies. Compared to theorized hunting techniques of Neanderthals and earlier human groups, Gravettian hunting culture appears much more mobile and complex. They lived in caves or semi-subterranean or rounded dwellings which were typically arranged in small "villages". Gravettians are thought to have been innovative in the development of tools such as blunted-back knives, tanged arrowheads and boomerangs. Other innovations include the use of woven nets and oil lamps made of stone. Blades and bladelets were used to make decorations and bone tools from animal remains. Gravettian culture extends across a large geographic region, as far as Estremadura in Portugal. but is relatively homogeneous until about 27,000 BN. They developed burial rites, which included the inclusion of simple, purpose built, offerings and/or personal ornaments owned by the deceased, placed within the grave or tomb. Surviving Gravettian art includes numerous cave paintings and small, portable Venus figurines made from clay or ivory, as well as jewelry objects. The fertility deities mostly date from the early period; there are over 100 known surviving examples. They conform to a very specific physical type, with large breasts, broad hips and prominent posteriors. The statuettes tend to lack facial details, and their limbs that are often broken off. Coastal Gravettians were able to avail of marine protein. From remains found in Italy and Wales, carbon dating reveals that 20-30% of Gravettian diets of coastal peoples consisted of sea animals. Populations of lower latitudes relied more on shell fish and fish while higher latitudes' diets consisted of seals. Clubs, stones and sticks were the primary hunting tools during the Upper Paleolithic period. 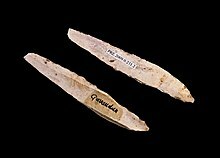 Bone, antler and ivory points have all been found at sites in France; but proper stone arrowheads and throwing spears did not appear until the Solutrean period (~20,000 Before Present). Due to the primitive tools, many animals were hunted at close range. The typical artefact of Gravettian industry, once considered diagnostic, is the small pointed blade with a straight blunt back. They are today known as the Gravette point, and were used to hunt big game. Gravettians used nets to hunt small game, and are credited with inventing the bow and arrow. Gravettian settlers tended towards the valleys that pooled migrating prey. Examples found through discoveries in Gr. La Gala, a site in Southern Italy, show a strategic settlement based in a small valley. As the settlers became more aware of the migration patterns of animals like red deer, they learned that prey herd in valleys, thereby allowing the hunters to avoid travelling long distances for food. Specifically in Gr. La Gala, the glacial topography forced the deer to pass through the areas in the valley occupied by humans. Additional evidence of strategically positioned settlements include sites like Klithi in Greece, also placed to intercept migrating prey. Discoveries in the Czech Republic suggest that nets were used to capture large numbers of smaller prey, thus offering a quick and consistent food supply and thus an alternative to the feast/famine pattern of large game hunters. Evidence comes in the form of 4 mm thick rope preserved on clay imprints. Research suggests that although no larger net imprints have been discovered, there would be little reason for them not to be made as no further knowledge would be required for their creation. The weaving of nets was likely a communal task, relying on the work of both women and children. The Gravettian era landscape is most closely related to the landscape of present-day Moravia. Pavlov I in southern Moravia is the most complete and complex Gravettian site to date, and a perfect model for a general understanding of Gravettian culture. In many instances, animal remains indicate both decorative and utilitarian purposes. In the case of, for example, Arctic foxes, incisors and canines were used for decoration, while their humeri and radii bones were used as tools. Similarly, the skeletons of some red foxes contain decorative incisors and canines as well as ulnas used for awls and barbs. ^ Noiret, Pierre (2013). "De quoi Gravettien est-il le nom?" [Gravettian is the name of what?]. In Marcel Otte (ed.). Les Gravettiens. Civilisations et cultures (in French). Paris: Éditions errance. pp. 28–64. ISBN 978-2877725095. ^ a b c Nývltová-Fisáková, M. (2005). "Animal bones selected for tools and decorations". In J. Svoboda (ed.). Pavlov I southeast: A window into the gravettian lifestyles. Brno, Czech Republic: Academy of the Sciences of the Czech Republic, Institute of Archaeology. pp. 247–251. This page was last edited on 20 April 2019, at 02:54 (UTC).